I had only owned my newest sweater for about a month when I realized I had ripped a hole in its elbow. To be fair, it was a pretty cheap sweater from H&M and sometimes you really do get what you pay for. I was still bummed out about the hole, though, so I decided to knit some fun elbow patches to cover it up (and to protect the other elbow from getting holes too). I've seen various iterations of heart-shaped elbow patches on sweaters in stores and on the internet, but I haven't seen any knitting patterns for them so I made up my own. This pattern is similar to the hanging heart knitting pattern that I posted last Valentine's Day, except I made this one slightly shorter and wider and less pointy on the bottom so that it would cover my elbows properly. I also knitted these patches with 2 strands of yarn at once in order to make them extra thick and sturdy. kfb: Knit front and back. An increase stitch involving knitting the front and the back of a single stitch to create 2 stitches. k2tog: Knit two together. A decrease stitch involving knitting two stitches together to form a single stitch. k2tog(tbl): Knit two together through the back of the loop. Inserting the needle through the back of the loops of 2 stitches to perform a k2tog decrease stitch. k3tog: Knit three together. A decrease stitch involving knitting three stitches together to form a single stitch. k3tog(tbl): Knit three together through the back of the loop. Inserting the needle through the back of the loops of 3 stitches to perform a k3tog decrease stitch. Repeat rows 1 through 6 again, starting by casting onto the empty needle. Bind off purlwise and weave in the ends. 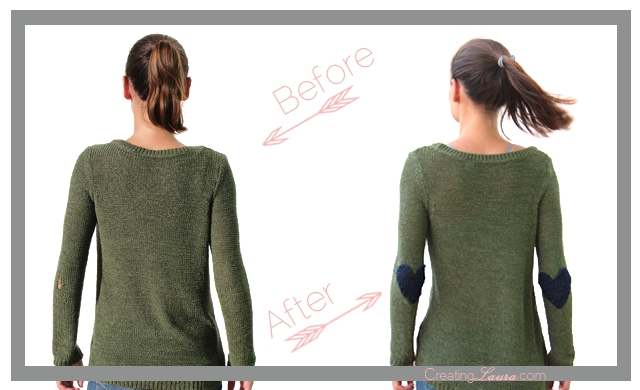 Use safety pins to attach the patches to the sweater, then try it on to make sure they are in the right spots. 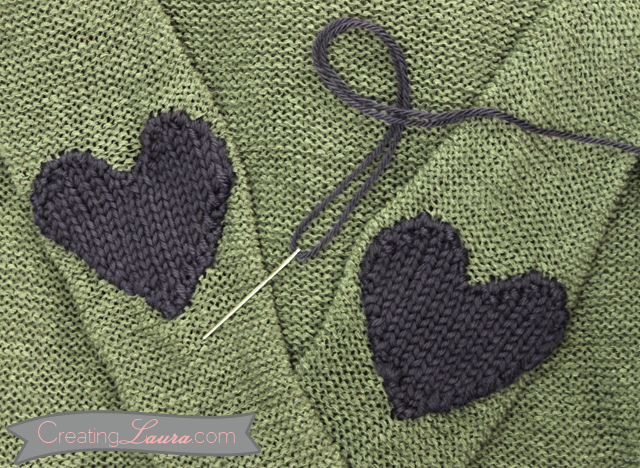 Once you've got them in the right place, sew the patches onto the sweater using a tapestry needle and the same yarn that you used to knit the patches. I couldn't be happier with the way my elbow patches turned out, and I hope you feel the same way if you choose to knit these too. Here's a before and after picture of my sweater. Note the hole in the left elbow on the "before" side. And just for funsies, you can also note how crazy windy it was when I took the "after" shot. My word this is adorable! Thanks for sharing this awesome pattern! 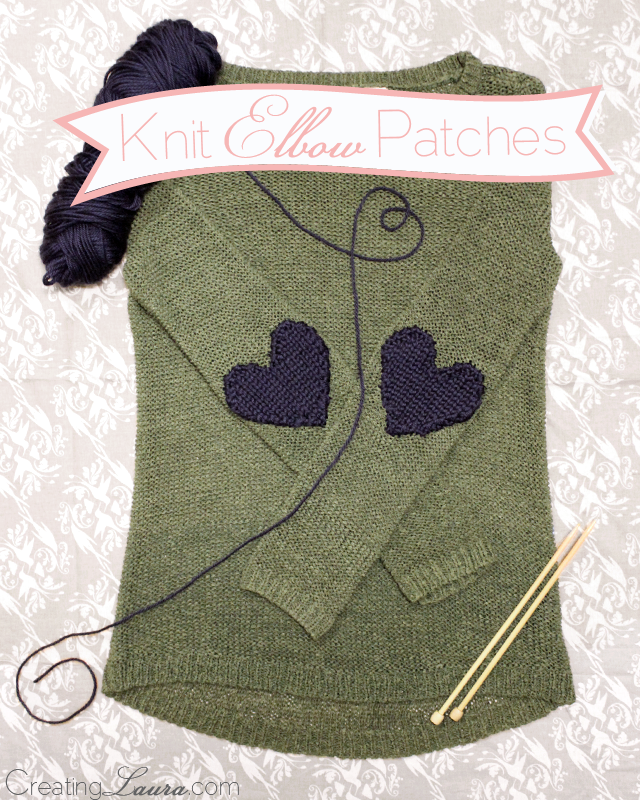 Heart elbow patches??? Could they be any more adorable? LOVE! Laura, these are just the cutest! I like that you didn't go with a traditional red for the hearts. It gives it some edginess. Is that simply soft yarn?